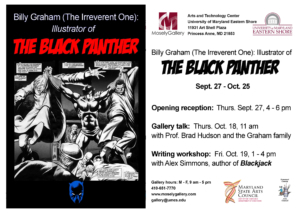 What: BILLY GRAHAM (The Irreverent One): Illustrator of THE BLACK PANTHER. On Oct. 18th, Alex will be attending this exhibition for a Gallery Talk with the family of Billy Graham. On Oct. 19th, Alex will be giving a Writer’s Workshop, from 1-4 pm. *The actual exhibit of Billy Graham art opens September 27th and runs through October 25th. COMICS and US: A look through 70 years of our social history as seen through scenes in comics. What: Alex met with and interviewed artists from the Comics Center of Helsinki. What: Alex was an invited guest and lecturer at the 20th Young Comic Artists Festival.